12/11/2018: I actually finished one of these tasks a couple days previously, but wanted to finish one other before posting. So here we are, with Tasks 1 & 4 completed! Write a book wish list to St. Nick. After I stopped laughing, I decided that the best approach to this task would be to narrow down my wish list to authors and series. And I decided not to do any looking up of what books would be on my wish list. Because if I tried too hard, this list could get a little out of control. So, I'm approaching this task by listing authors, books, or series I can think of first... and limiting myself to a list of twenty. If I didn't limit myself, I'd probably list a lot more books and this task could go on forever. If I didn't give myself at least twenty entries, I'd feel a bit disgruntled. 1. Any and all books by Jayne Ann Krentz as well as all her pseudonyms (Amanda Quick, Jayne Castle, etc.) -- I have a mission to read all JAK books. 2. The paperback for The Raven King by Maggie Stiefvater. -- I've been meaning to finish off my collection with the last Raven Cycle book... that I've not purchased yet for some strange reason, even though I've finished reading the series. 3. The paperback for Winter by Marissa Meyer. -- Same reason as above. 4. A paperback (or hardcover) collection for Deanna Raybourn's Veronica Speedwell series. Yes, all of the published ones as well as subsequent installments not yet published or even written yet. 5. The InCryptid series, whether paperback or e-book! -- Two words: Aeslin mice! 6. The next Laura Griffin publication, Stone Cold Heart, coming out in 2019. -- Because I always buy each new Laura Griffin book. 7. Any and all variations on the Harry Potter series books, especially the fun ones that create some sort of painting or picture when the book spines are placed together. 8. All supplementary books to the Harry Potter world such as Fantastic Beasts and Where to Find Them, A History of Magic, Quidditch Through the Ages, and so on. 9. All the Cormoran Strike books both in hard copy as well as audio book. -- So that I can lend the books to friends who might be interested, and also because I'd love to "reread" them in the form of audio as I've heard the audio books are quite good! 10. All of Juliet Marillier's books in paperback, even the books I've read, whether I've liked them or not, just because she's Juliet Marillier. 11. An English translated version of Kara no Kyoukai (The Garden of Sinners) as I've been awaiting a full English translation of this light novel series for the longest time... yet unfortunately, Del Rey went defunct before the official translations could be done... If you could make this happen, St. Nick, that would be wonderful! 13. While you're getting English translations, St. Nick, I'd love one for The Twelve Kingdoms (Juni Kokuki) light novel series. I know a few volumes are already translated, but not all of them are. 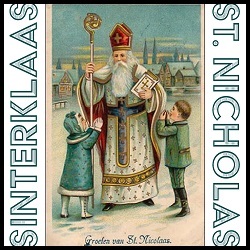 Thanks in advance, Mr. St. Nicholas, Sir! 14. Since we're on the subject of light novels: The .hack series novels in all it's various franchises; Kino no tabi (Kino's Journey); Book Girl; Moribito; and some others I might not have listed because I don't remember them. If they are not translated into English, could we get them translated? Learning Japanese was not an easy task, and required a lot of looking words up just to get through a sentence. 15. All of Susanna Kearsley's books. -- I may not like all of them, but I still want all of them, because I love her writing style. 16. The Others series by Anne Bishop, as well as any and all future installments. 17. A collection of Historical Romances from some of my favorite Historical Romance authors, Tessa Dare, Courtney Milan, Jeannie Lin, and Sherry Thomas. 18. A collection of Historical Mysteries I'm curious about reading, including: Lady Darby by Anna Lee Huber; Sebastian St. Cyr by C.S. Harris; Madam of Espionage by Carol K. Carr; and obviously all the Sherlock Holmes adventures. 19. Dear St. Nick, This particular one is less a book wish and more of a library wish, in that I need a place for all of these books you might be getting me. I will definitely be needing more shelve space, and probably just a whole new room to place everything, k thx! 20. My official (recently put together) wish list linked. Yeah, I know I said I wasn't going to look anything up, but I decided this would make things easier for St. Nick. You know, just to cover all my bases in case I've forgotten any books. Thanks in advance, Kind Sir! I look forward to all my new goodies! You are King / Queen for the day and can have 3 ‘wishes’: one for yourself, one for your community (however you define it), and one for the world: What are they? I'm not sure I'd be able to come up with wishes, but if I think of any, I'll come back to this one. If your holiday family traditions should include bowls or plates filled with gingerbread, cookies, oranges / tangerines, chocolate, nuts and the like, share a photo with us! Our family usually does a tray of candies and sweets for the Lunar New Year. Unfortunately, this won't be until closer to the end of January this Lunar New Year, so I may not have any photos. If there's a chance I can find one, or get a picture of these trays of sweets, I'll try to put an update here. Otherwise, I'll try to Google something. List your 3 favorite books involving children being rescued from serious peril. 1. 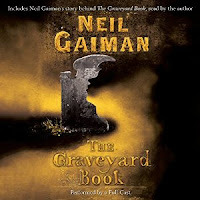 The Graveyard Book by Neil Gaiman // Bod somehow rescues himself as a baby, then the rest of the graveyard residents continue to keep him safe from the cold-blooded killer who slaughtered his parents. 2. The Ghost Bride by Yangsze Choo // Li Lan ends up in a half-dead, spirit state and rescues herself with help from the Dragon. 3. 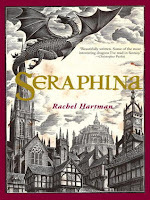 Seraphina by Rachel Hartman // Seraphina's very existence puts her in peril each day and she rescues herself by saving the world, sort of. I also wanted to add Sideway Stories from Wayside School, because the very existence of this school is, honestly, perilous to all the children who attend. But I'm not sure anyone ever gets rescued, so it's not staying on the list. Read any book with an orange or red cover or with nuts, chocolate or coins on the cover, set in The Netherlands or Germany, by a Dutch or German author, or with canals or beer on the cover. The easiest part of this task will be the book cover colors, but I might also look for chocolate or coins, or even beer or canals. Though there ARE some books by a German author I could use.